Facebook reported a nice 72 percent boost in sales for the first quarter, as the company continues to make strides expanding its advertising business on mobile devices. Total revenue for the period ended March 31 was US$2.5 billion, Facebook reported Wednesday, beating analysts' estimates of $2.36 billion, as polled by Thomson Reuters. Net income was $642 million, nearly tripling the $219 million in profit reported for the same quarter in 2013. Earnings per share for 2014's first quarter were $0.25, up from $0.09 in the year-ago period. 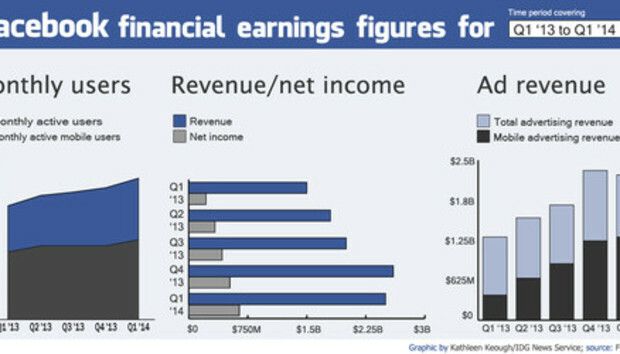 Excluding share-based compensation expenses and related adjustments, Facebook's earnings per share were $0.34, soaring past analysts' expectations of $0.24. Facebook makes the bulk of its revenue from advertising -- $2.27 billion for the quarter, up 82 percent from last year, the company said. Mobile advertising constituted about 59 percent of that total. Facebook's stock was trading around $63 in after-market hours Wednesday, up slightly from its close. "Facebook's business is strong and growing, and this quarter was a great start to 2014," said CEO Mark Zuckerberg in the company's announcement. When Facebook went public in 2012, the company faced questions from investors over its ability to make money on mobile devices. But in recent quarters the company has consistently grown its ads business on mobile, and now that's where the majority of Facebook's revenue comes from. In its previous earnings report in January, the company reported that for the first time, the amount of money it made on mobile as a percentage of all ad revenue had crossed the 50 percent threshold for the first time. The company faces other challenges now in increasing its user base -- and keeping its users engaged. In its results, the company said that it now had 1.28 billion monthly active users -- a 15 percent increase year-over-year, but only a 4 percent increase from the number reported last quarter. Facebook said Wednesday that it had 1.01 billion monthly active users on mobile, representing a 34 percent increase year-over-year. Facebook also announced Wednesday that its chief financial officer, David Ebersman, would be leaving that position in June after nearly five years on the job. He will be replaced by David Wehner, currently Facebook's vice president of corporate finance and business planning. Facebook will take questions from investors and financial analysts during a conference call Wednesday afternoon. Zuckerberg is likely to be asked about the success of specific types of ad products, such as mobile app install ads, which are seen as being lucrative for Facebook.